It’s been a year of ups and downs in the real estate industry. What began as a seller’s market, marked by high home prices changed significantly by the end of 2018, as power shifted towards buyers. Current circumstances have an uncertain environment going into 2019. The market correction that began towards the end of 2018 is expected to define the first quarter of 2019—this will translate into an overall drop in home sales. Among the most significant reasons for this correction are rising mortgage rates, exacerbated by an already-dire lack of affordable housing options, especially in high-density metropolitan areas. As MarketWatch reports, there’s also been a downturn in interest from international buyers who were previously consistent buyers in coastal cities. The rise of the millennial homebuyer is by no means a new trend, but as the majority of millennials will be turning 29 this year—prime home buying age—they will continue to set the tone for the real estate industry. Studies show that millennials are still buying homes at high rates, although no doubt plenty of them are deterred by increased mortgages and high costs. According to Realtor.com, approximately 45% of all mortgages will go to millennials in 2019. This will have a ripple effect across the whole. They’re returning to the suburbs or settling down in second-tier cities, known as 18-hour cities in low-cost states such as Dallas, Raleigh, Minneapolis, and Denver. Millennials also have high expectations when it comes to amenities. They want their homes ready-to-go, not just fitted with new kitchens, but sometimes featuring gyms, smart-home technologies, and in-home theatres. There’s no way to sugarcoat it: we’re in an affordability crisis, and although small and mid-sized cities are a little bit more affordable, there are no exceptions. The numbers are telling. On average, millennials spend 45% of their income on rent. According to the National Apartment Association, due to the US’ aging population and declining home purchases, Americans will need 4.6 million new apartments by 2030. It should be noted that it’s an affordability crisis—not an across-the-board housing crisis. New units are being built, but they tend to cater to high earners and luxury markets, not to lower and middle-class communities. New and emerging technologies continue to disrupt many industries, and real estate is no exception. Mobile apps and websites have already changed the way that prospective buyers conduct research and interface with realtors, and vice versa. However, new tech isn’t just changing research and communication practices—it’s also changing buying methods themselves, as Fintech and cryptocurrency continue to gain prominence and legitimacy. Although there’s still some catching up to be done, more and more people are buying and selling properties using Bitcoin and other cryptocurrencies. Artificial intelligence will also creep into the real estate sector, as more and more companies implement machine learning in a variety of ways: from dealing with clients to building efficiency to trend forecasting, to analyzing successes and failures, artificial intelligence can reveal knowledge previously unknown or unnoticed. The other technology trend will be in response to the lurking specter of climate change. The recent IPCC climate report called for a widespread transformation in fossil fuel consumption; builders have started building using recycled materials, installing solar panels, and adopting other green practices. 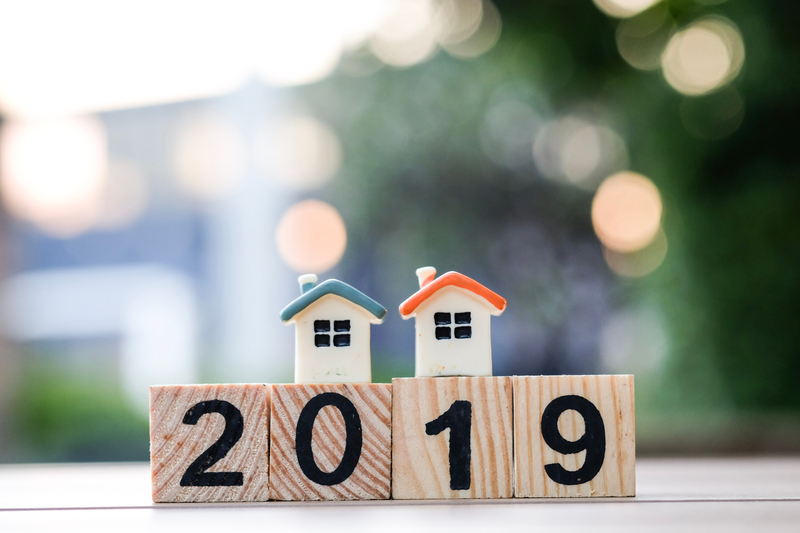 There are many factors to consider when identifying 2019 real estate trends—public policy, new trends in living and labor, demographic change, and affordability are all pivotal issues that will define the industry in 2019 and beyond. Although speculation is informed by the current trajectories and buying habits, there are no guarantees. There are so many circumstantial factors—just in the past year, factors that have greatly affected real estate markets—such as the tax plan and the new Amazon HQ2—have come virtually out of left field. Following trends means empowerment for you in 2019, but always remember to expect the unexpected.